We Invite You To Share Your Insights With Us! The question of the true spelling and pronunciation of the Sacred Names has caused endless speculation, arguments, and division. Even now the Sacred Name community is greatly impacted, and greatly impaired, by the disagreements among its adherents. Can we find definite answers? Can we find common solid ground on this issue? We, too, had questions about the Divine Names, and were not satisfied to accept a popular consensus; we wanted to know the Truth! The result of our now fifteen-year quest is in the process of careful typing and posting on this website for your benefit. Our hundreds of pages of notes on the Sacred Name are being distilled into a succinct manageable size for our readers. Due to copyright issues, we can only quote short statements from our sources, but on our "Introduction" pages we have given the sources and page numbers for you to read more, or for doubters to check the veracity of our quotations. We realize that no amount of scholarly statements or other forms of proof will be enough to convince the many people who are not interested in having us "rock" their boat. They will deny the importance of our sources and ridicule our conclusions. We expect that! However, we hope that those of our readers who truly care about truth and are willing to contravene tradition, will enjoy and benefit from all of our labors. We initially began this study for ourselves, and our own information, but feel that it is too important not to share, free of charge or obligation of any kind. If you have additional information and/or scholarly quotations for us to share on this website, we would love to hear from you. Let us expand this effort to make it a community project. And let us hope that we can unite around Truth rather than mere Tradition. May Yah bless you as you follow Him by Name! You can reach us using the email response form under the "Participate" menu. 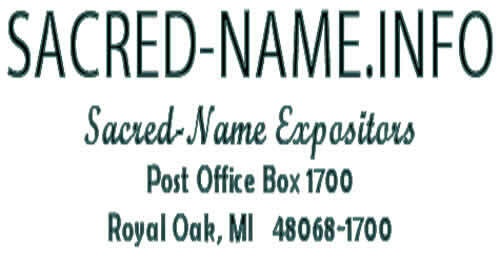 We also have a public Sacred Name poll, and a public message board for you to post your thoughts for others to see. We will be adding to this site on a regular basis, so check back here often! Help us spread the good news on social media!